Google Drive's new templates gallery features some really cool templates you and your students can use for a variety of educational purposes from writing book reports to designing project proposals. Most importantly, these templates are very simple and easy to use and students will probably have no learning problems working on them. With a single click, you can add any template from Template Gallery right to your Google Drive and from there you can customize it the way you want. We have already featured few examples of some very good templates to try out in class. 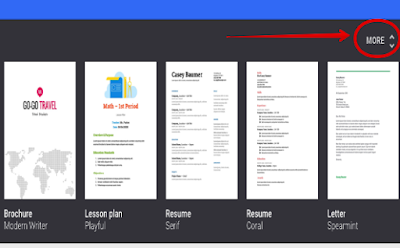 Today we are highlighting four excellent templates students can use to create professionally looking resumes in Google Docs. These resume templates come with different layouts. Some have only a single column and others have double columns. Students select the template they like and add it to their Google Docs. Once there, they can then start editing it, adding their own info and customizing its look. They can change text font and colour, delete or add sections, change headings and many more. To access and use any of these templates, go to Docs Gallery and click on 'More' on top right hand side and scroll down to Resume section.